Like clockwork, the February distribution numbers are out, and while it's not a milestone like last month when Froyo finally died, there are still some important things to take note of. Nougat is finally above 1.0% across both 7.0 and 7.1, clocking in at 1.2%. Ice Cream Sandwich and Gingerbeard are now level on 1.0% dead, while Jelly Bean sees a 0.3% decrease. 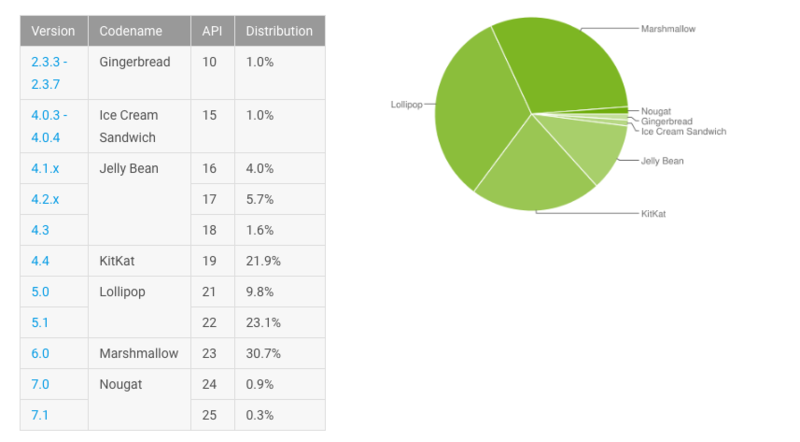 Lollipop has also decreased by 0.5%, but Marshmallow continues to grow by almost 1.0%, continuing the trend of being the largest numbered version. However, Lollipop is still the biggest named release, with 32.9% market share, with 5.0 having the significantly smaller share compared to 5.1, which incidentally appears to have peaked in January, and has now started its decline. Hopefully, as new flagships are released with Nougat on board, the numbers will start to increase, with Marshmallow beginning to fade as this happens. It's the best we can hope for, anyway - especially with Optimum's mistake yesterday. Either way, let's continue to be glad the Froyo deathwatch is over, although the Gingerbread deathwatch hasn't advanced at all this month.